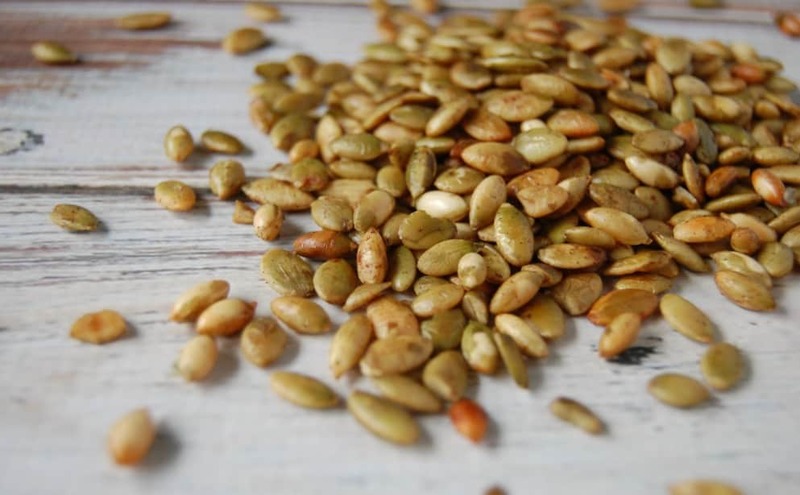 This is the time of year where you can actually make your own pumpkin seeds! Pumpkin seeds of course are a great healthy and nutritious snack. They are also extremely customizable. You can make them sweet like pumpkin pie or you can make a savory version or a spicy version, really you can do anything with them so long as you have the spices you want! However, as pumpkin seeds are seeds they do contain phytic acid. For those of you who have not heard of phytic acid before and why we should soak our grains, seeds, and nuts first, here is the run down. Phytic acid prevents the absorption of nutrients such as iron, calcium, magnesium, copper, and zinc. If you are eating grains, seeds, or nuts that haven’t been properly prepared first (by soaking, sprouting, or fermenting) then you aren’t getting as many nutrients as you could. Pumpkin seeds have so many amazing nutrients and benefits so naturally we want to get as much out of them as possible! So how do we deal with that phytic acid and get as much nutrients from pumpkin seeds as is possible? Thankfully it’s very easy to remove most of that phytic acid. All you need to do for pumpkin seeds is soak in some water and salt for a while and you are all set to go. Won’t soaking pumpkin seeds just make them soggy? Well yes it will until ,you cook them! Once you soak your pumpkin seeds then you roast them like all pumpkin seeds are roasted and those once soggy seeds crisp up beautifully. Soak: Take your clean pumpkin seeds and place in a bowl. Cover the seeds with warm water and a bit of salt. I do not really measure this but 1tbs salt for 4 cups water is a good guide if you need one. Let seeds sit at room temperature for 24 hours. Drain: Drain the water from the pumpkin seeds and allow the seeds to dry on a baking sheet for a few hours. Alternatively you can just cook your seeds for 5-10 minutes in a 300 degree oven before moving on to the roasting part. Roast: Toss seeds in oil and spices of your choice. Lay seeds on a baking sheet in a thin layer. Roast seeds at 300 degrees for 20-30 minutes. Stirring every 10 minutes or so. Really the options are limitless! I love pumpkin seeds! I'm going to test this one out thanks! I had never soaked my pumpkin seeds before… I hadn't thought about the phytic acid content. Thanks for bringing this to my attention – I'll definitely be soaking my seeds next time! We just made some roasted seeds the other night but I never thought to soak them so will do it next time! I also love the spice options, I've only ever salted them so I'm going to branch out and try some other spices next time! I never thought to soak them either. I'll have to do that next time! Thanks! What about the seeds with shells (maybe they r the old ones)? Cos v get those type more easily here…i mean ..shud i soak them, hull them n then roast them? So what I have in the pictures are pepitas but pepitas are just shelled pumpkin seeds. Pepitas are green, pumpkin seeds are white. Normally I actually use pumpkin seeds but pepitas were what I had on hand for the photos. They are really one and the same though. (more fiber from pumpkin seeds though) Just follow the recipe as it says. No need to hull them. Thanks for the article. 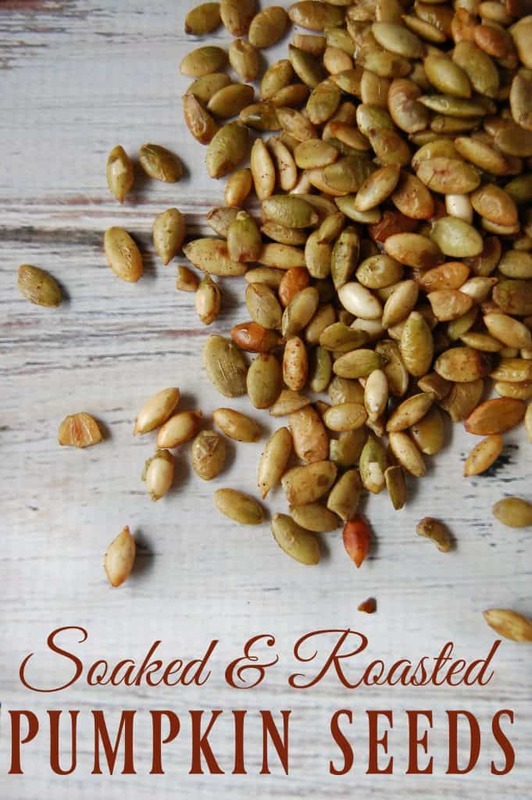 This is the first hit that came up when I googled “roasted pumpkin seeds soaked in salt water.” One more thing I’d like to know about — do you have any tips for separating the seeds from the pumpkin pulp and washing them? That was the hardest part! Happy Halloween! I know that this post was about a year ago, but we put the pulp with seeds still attached in a bowl of water and then if you just squeeze the seed where it is attached to the pulp, then it pops right off and you can throw the pulp in the trash as you go. Also the loose seeds will float to the top of the water. Then once you think you have all of the seeds separated, dump the yucky water, put fresh water in with the seeds and give them a stir with your hand (the pulp that was still strung along the seeds with float to the bottom) then scoop out the seeds, refresh the water one more time for them to soak in and voila! It is my understanding that heating nuts and/or seeds above 130 degrees damages the “good” fat that occurs naturally in them. Since no oven roasts at that low temperature, it is better to dehydrate them. You lose that roasted, nutty flavor but at least they are crunchy and the healthy fat is protected. Hello. Thanks for sharing this process. I had one concern, does nutrients in pumpkin seeds lost after this process? If so, by how much percentage? The soaking shouldn’t remove nutrients but roasting does remove some of the nutrients as nutrients are sensitive to heat.